Summer (maybe should be plural, as in multiple summer) project. Making progress, still a ways to go. That is one seriously ventilated cab. Is it a F/A? Looks terrific so far. 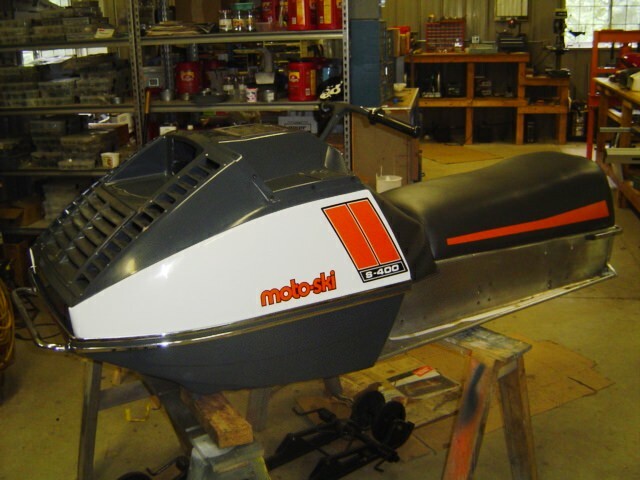 The 73 Moto Ski S models were both F/A, and had a BSE tagged rotax engines almost the same as the 73 Ski Doo F/As. The engine in this one was a 400 F/A, BSA engine tag type 399 (I think) Ski doo version had a Rotax tag type 396. The Ski Doo version had a CDI, the moto Ski had points. The Moto Ski version was an outgrowth of the 72 TNT F/A 400 (rotax type 398?) that was also points, but had a threaded PTO crank stub. The 73 BSE used a tapered end PTO. History of the sled is out there; brief summary is it had a way too restrictive air box and large numbers were burning down. Long narrow metal hood louvers were supposed to be a post-production add-on to address this issue. Looks like they did come from the factory with a cylinder over-temp sending light (not a gauge). It was mounted below the tach/speedo in the tank cover. The history is all second hand as I don’t remember myself. There weren’t any M/S dealers in the Central Wi area I grew up in. But it all sounds plausible as the OE air box (sort of looked like two triangular cake pans with a snorkel affair on one side) are pretty rare; most were tossed in the trash, I believe. I remember looking at pics of the sled back then in the 73 mags thinking it had a way cool look to it. Certainly skin deep, however. What was surprising tearing this one apart is the chain chase/secondary assembly. Chain is a single row, case is packed with grease, not oil----don’t believe that qualified as high performance even back in 73. Secondary is also an eccentric style thing. Haven’t been able to figure out if it’s serviceable or not. I’ve been looking for years and have yet to find a 1973 Moto Ski shop manual. If they made them, they didn’t make a lot. Trying to learn how to locate and install snaps so I can finish the repop tank cover. If you look real close you can tell that the tunnel is actually a 74. I have the 73, but it has under seat tunnel damage from a broken cleat. Torn between using that one and finishing this one up the way it currently sits. So, because it has a rotax licensed engine in it and board postings are slow thought I could hog some space. Feel free to ax if you’d like Monty……. Nice ride G&G!!! Gotta like the look of that hood (and seat ). You'd have to be a purist moto-skier to tell differences like that. Good luck and lets see more of that beast.